* Berserk: After 25 minutes Illidan does a hard enrage. * Fireball: casting time 2 sec, Deal fire damage 3k-4k in 10 yards radius. * Shadow Blast: 20 yard AoE for ~11k shadow damage centered on highest aggro target, cast every 2 sec, resistible. * Flame Burst: 20 sec cooldown, 3.5k fire damage to all raid members plus extra splash damage to players closer than 5 yards to each other. Resistible. * Shadow Demons: ~40 seconds into the phase, 4 Shadow Demons with ~22k HP spawn at Illidans position. They target random raid members and paralyze (stun) them, then move slowly towards their targets, kill them when they're there, then target somebody else. * Aura of Dread: A 15 yard aura around Illidan for 1k shadow damage per second also increasing Shadow Damage taken by 30%. This effect stacks over time. * Blaze: AoE dealing 5k fire damage per second, centered on the ground at current target. Blaze always appears shortly after Flame Blast, and its location is decided at the instant the Flame Blast goes off. Weaknesses: Gatherings of up to 25 people. Background (Please keep this semi-short): Illidan (aka The Betrayer), twin brother of Malfurion, practiced Highborne magic. In his youth, he attempted to master the druidic forces, as his brother had, but the sorcery called to him in a way that the magic of the land did not. Unlike his brother, Illidan was born with amber eyes, at the time a sign of a great destiny - however, this actually indicated inherent druidic potential. When Malfurion and Tyrande had found their destiny, Illidan was still searching for his. Though not a Highborne himself, he became the personal caster of the military leader Ravencrest. When Archimonde's invasion of Azeroth had begun and Azshara's treachery became known, Malfurion convinced Illidan to leave his queen. Illidan followed his brother. But as Cenarius and the dragons entered the battle, Malfurion came to understand that their adversaries were too powerful to fall in combat. To end the invasion, he plotted the destruction of the Well of Eternity. The idea appalled Illidan. The Well was the source of his magic — and likely of the elves' immortality — and its loss was a price far too dear for him to pay. In addition, the night elf found that he increasingly admired the powers of the Burning Legion, seeing a magical purity that underlay their chaotic behavior. Where the night elves struggled to maintain their ground, the Burning Legion's numbers did not seem to permanently diminish. The satyr Xavius seized upon his doubts, exploiting his confusion to plant seeds of distrust into Illidan's mind which made Illidan turn to seek the power the Burning Crusade were using so he could become stronger, while in his mind this was to help defeat the Burning Crusade he actually helped them by giving Sargeras the Demon Soul to make the portal stronger. Illidan had strong feelings for Tyrande Whisperwind, a novice priestess in the Sisters of Elune. Illidan so desired to impress Tyrande that he often acted without thinking, particularly in magic; he never realized that these displays weren't quite what the priestess was looking for in a mate. But while Illidan struggled to win her heart, none of them realized that the battle was over soon after it had begun; Tyrande had chosen Malfurion almost from the beginning. Xavius knew of this and used his power to darken Illidan's thoughts, convincing him that if Malfurion were to die, Illidan would no longer have a rival for Tyrande's love. Finally the sight of Tyrande in the arms of his brother Malfurion shattered his final ties to the defenders. Illidan, with a new plan spurred into his mind, journeyed to Zin-Azshari. There he feigned allegiance to Azshara and Mannoroth. Illidan's plan was to obtain the Demon Soul, an artifact of great power created by Deathwing also known as Neltharion the Earth-Warder, which had the ability to close the portal which was allowing the demons to enter Kalimdor. However to put this plan in action, Illidan had to gain more power. Illidan was eventually brought before Sargeras himself, who quickly discovered the night elf's plan to obtain the Demon Soul for the Legion. Sargeras was pleased with this plan, and gave Illidan a "gift" in return for his allegiance. Illidan's eyes were burned out by Sargeras himself, despite still being beyond the portal, and orbs of mystic fire set in their place that allowed Illidan to see all forms of magic, and arcane tattoos covered his body. Azshara was fascinated by the "new" Illidan (who was wary of her advances), but remained cautious, sending Captain Varo'then to accompany Illidan in his search for the Demon Soul. After the Great Sundering, Illidan, who had filled seven vials with water from the Well of Eternity, scaled the peaks of Mount Hyjal, where he found a small, tranquil lake. There he poured the contents of three of the vials into the waters. The chaotic energies quickly manifested, tainting the lake and twisting it into a new Well of Eternity. Illidan's joy was short-lived however, when his brother, Malfurion, Tyrande and the rest of the kaldorei leadership discovered him - and all were horrified at what he'd done. Unable to accept that his brother had committed such treachery, Malfurion tried again to explain to Illidan the folly of his ways. The magic, he insisted, was chaotic by nature, and it could only bring about destruction so long as it existed. Illidan refused to listen, so enraptured by the magic's power that his brother seemed to him an unknowing fool. Illidan claimed that magic would be needed should the Burning Legion ever return. The lack of remorse shook Malfurion to his core and he raged at his brother, understanding now that Illidan was lost forever to the magic's sway. He ordered him imprisoned deep below Hyjal in a jail kept far from sight and mind. Illidan languished for 10,000 years in a lightless prison. Califax, a Keeper of the Grove, and a contingent of night elves kept constant guard over the Betrayer. Release came at the unexpected hands of Tyrande, who slaughtered the night elf guards in the hopes of using Illidan against the Legion, which had returned to Azeroth at the hands of the Scourge. With his love for Tyrande undampened through the millennia of confinement, Illidan agreed to help. He swore to throw back the Legion and to depart from the night elves forever. Feeling his sacrifice and effort were unappreciated, Illidan muttered "So be it...brother", and left the night elf lands. After the Legion's defeat, Illidan was visited by Kil'jaeden, who, while noting Illidan's sketchy track record with the Legion, offered him one final chance to serve them. He told him to seek out the Frozen Throne, and destroy it. Ner'zhul had grown far too powerful for Kil'jaeden to control, and Illidan was to remove him from the equation; in exchange for more power and magic than he could dream of. He granted him the Orb of Kil'jaeden to aid him in this task. Illidan called the naga to the surface. The naga, formerly the quel'dorei servitors of Azshara, were eager to take vengeance upon the night elves and the other land walking races that had been spared from The Great Sundering. Azshara sent her handmaiden, Lady Vashj, to establish contactMoM 189 and she eventually came to lead those who would be known as "Illidan's naga." But Illidan still had the troublesome warden, Maiev Shadowsong, to deal with, as she had persistently chased him all over Kalimdor. Illidan ran to the port of Nendis with his naga and satyr minions cleaning up behind him. When they came to the port, Illidan hijacked a boat and set sail, while a cadre of naga stayed behind to scuttle the ships and ruin all hopes of following him. But Illidan's servants had not been successful in destroying the boats. Maiev and the Watchers arrived on the Broken Isles shortly after Illidan, and the two forces battled across the watery terrain. Illidan reached the tomb, and Maiev was quick to follow. With Gul'dan's knowledge, Illidan quickly traversed the Tomb and came to the chamber which contained the Eye of Sargeras. Maiev came upon him as he and Vashj were activating the powerful artifact, and, as vengeance for her imprisoning him for ten thousand years, Illidan used the Eye to bring the Tomb down around her, and then quickly escaped through the underwater passages used by the naga. Though he killed Naisha and all the other Watchers within the Tomb, Maiev escaped with her magical abilities. On the surface, Illidan and Maiev battled for supremacy as the Warden sent out a runner to gather reinforcements from Ashenvale. After Malfurion let him go, Illidan created a portal to Outland and fled immediately, pursued by Maiev. Now that he had failed to destroy Ner'zhul, he knew that Kil'jaeden's wrath would not spare him, so he wanted to find a world where he could remain unmolested. He felt that Outland, the ruined remains of Draenor, was just such a place. Illidan was chased down on the shattered world until he was captured by Maiev and the Watchers, and imprisoned once again. But he was saved by Kael and Vashj. 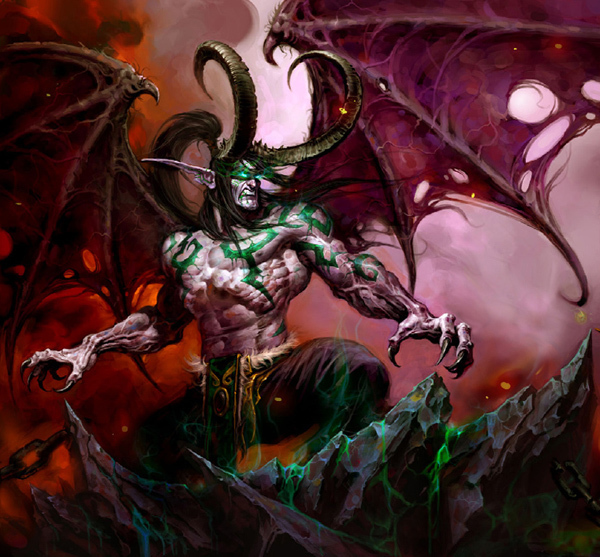 Illidan accepted the allegiance of the blood elves, and made Kael his second-in-command. The Sin'dorei, coupled with the naga, would be very invaluable to his plans. Illidan continued his original plan - to rid Outland of demonic influence so that he could stay out of Kil'jaeden's grasp. To do this, they laid siege to the Black Temple of Magtheridon, the Pit Lord who had taken control of the world. But first, Illidan systematically shut down his dimensional gates to stem the flow of reinforcements. Eventually, they succeeded. But Illidan was not finished yet. Meeting the weakened Arthas at the glacier's base, the two warriors engaged in single combat. After a few minutes of exchanging blows, however, Arthas overcame Illidan's defenses and cut him down. Illidan Stormrage fell in the snow, dead, or so it seemed. He was badly wounded, but not killed. After it became clear for Vashj and Kael that they could not destroy the Frozen Throne, they retreated, eventually back to Outland, taking Illidan with them. Then they were dimensionally displaced on the Blaze of Glory. Only Illidan and Kael'thas survived.